For the past two years, the Museum’s Money Tree has been the subject of intense scientific examination and conservation. This spring, the Museum will celebrate the restoration of this extremely rare bronze sculpture in a special presentation that places it in the context of major cultural developments in ancient China. Crafted in southwest China during the Eastern Han dynasty (25–220), the Money Tree embodies wishes for eternal prosperity in the afterlife. Dragons and phoenixes, symbols of longevity, cavort across the surface of sixteen bronze leaves, each dotted with coin designs. The crown of the tree—previously hidden beneath layers of encrustation, but now revealed by the conservation process—features two monkeys holding bananas, flanking an upright humanoid figure. 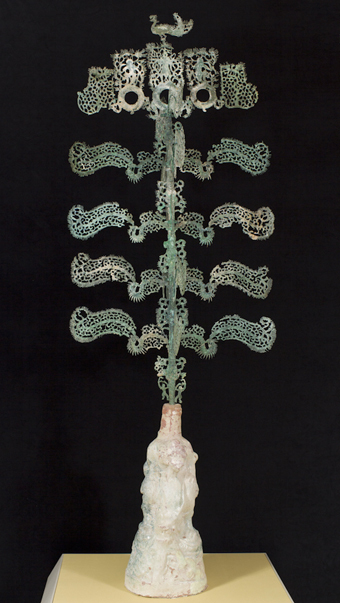 The Money Tree is an example of funerary art, an object made expressly for burial, and eloquently expresses the Han-period obsession with the afterlife. In this installation, it will be joined by three other works of outstanding quality that reflect the ideals and values of formative periods in Chinese history. A bronze hu (wine vessel), richly ornamented with incised designs of dragons, birds, and monster masks, was cast in the 13th or 12th century BCE for use in ritual banquets for the ancestors of the Shang royal house. The Shang ruled over northern China at the time, and their ritual bronze vessels were emblems of power and legitimacy. Another bronze work, a ritual bell known as a nao, dating to between the 12th and 10th centuries BCE, illustrates the spread of Shang bronze casting technology to southern China, but its surface designs betray a rejection of Shang authority. The fourth masterwork will be an eerie antlered figure of an Earth Spirit, carved of wood between the 4th and 3rd century BCE and unique to the ancient kingdom of Chu in south central China. Funding for the conservation of the Money Tree provided by The Arlene and Harold Schnitzer CARE Foundation and the Asian Art Council. Scientific research and analysis by Dr. Tami Lasseter Clare, Chemistry Department, Portland State University.